Roughly 15,000 U.S. troops will be in Afghanistan in the coming months, as defense officials on Wednesday finally acknowledged the actual number of American forces in the country after long camouflaging the total in misleading accounting measures and red tape. Senior Defense officials for the first time explained there are about 11,000 U.S. forces currently deployed to Afghanistan, not the 8,400 number that is routinely reported, says CBS News National Security Correspondent David Martin. This is a function of how troops have been counted by the Pentagon. Under the Obama administration, any troops in Afghanistan on temporary duty (which can last up to 179 days) were not counted against the troop level of 8,400. Now all boots on the ground will be counted. Excluding the troops on temporary duty allowed the Obama administration to keep the number as low as possible. The new baseline of 11,000 is expected to go up by about 3,800 when Defense Secretary James Mattis signs the deployment orders for the mini-surge ordered by President Trump. Similar accounting procedures have been used in Iraq and Syria and those troop numbers can be expected to rise as well, when the Pentagon releases them. Chief Pentagon spokeswoman Dana White said that while the same "principles of transparency" will apply in Iraq and Syria, those countries have their own interests. There have long been political sensitivities within the Iraq government about the number of American troops on the ground, and those concerns raise questions about whether the Pentagon will be less candid about force numbers there to avoid conflicts. Based on troop caps instituted by the Obama administration, the number of U.S. forces in Iraq has consistently been reported as 5,262, but officials say there are actually more than 7,000. And there are at least 1,500 U.S. troops in Syria — three times the 503 that the Pentagon will acknowledge. White said details on troop numbers in Iraq and Syria would be announced in the future. The troop numbers announcement comes as the Pentagon is preparing to deploy several thousand more Americans to Afghanistan, in order to expand the training and advising of Afghan forces and beef up counterterror operations against the Taliban and al-Qaida-linked groups in the country. Officials have said the U.S. will send as many as 3,900 more troops to the war — which would bring the number of publicly recognized troops there to about 15,000. The officials were not authorized to discuss the future deployments publicly so spoke on condition of anonymity. Lt. Gen. Frank McKenzie, director of the Joint Staff, said providing more truthful numbers "is an attempt to actually clarify a very confusing set of reporting rules that has the unintended consequence of forcing commanders to make readiness tradeoffs as they deploy their forces." As an example, Gen. John Nicholson, the top U.S. commander in Afghanistan, noted earlier this year that when Obama ordered the cut in troops to 8,400, commanders had to hire contractors to do jobs that American forces would normally do. So, an aviation brigade that deployed to Afghanistan was able to bring its helicopters, pilots and staff, but the mechanics had to be left behind at Fort Riley, Kansas. 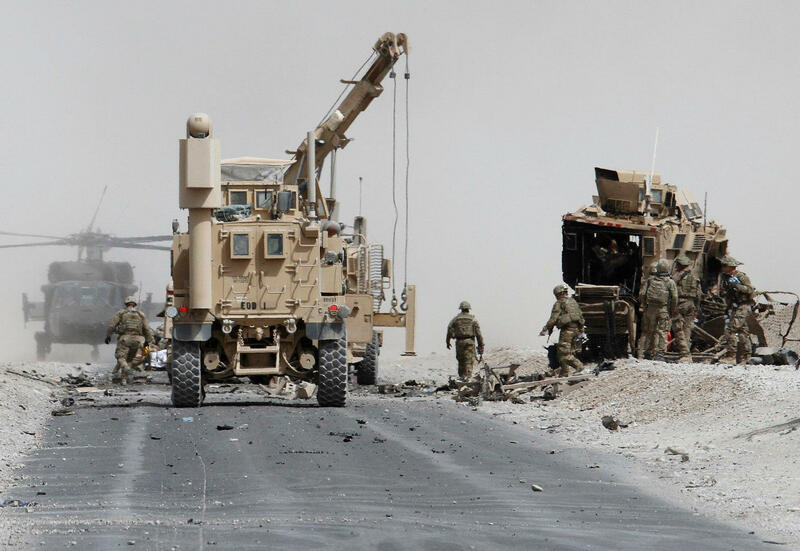 The contractors hired to replace the mechanics, Nicholson said, cost "tens of millions of dollars" and hurt the unit's overall military readiness. White and McKenzie said there have been no final decisions about future deployments to Afghanistan, but those should be coming soon. Others have said that some small numbers of troops have moved into the country from nearby within the region, but there have not been any new deployment orders for forces based further away, such as the U.S.
Officials said that once Mattis makes his decision, a few hundred troops could be ready to deploy quickly — within days, while others could take several weeks to get into Afghanistan. In the close to 16 years since the United States went to war in Afghanistan, the number of American troops initially grew in spurts, as U.S. leaders wavered about how much focus to put on the war. President Barack Obama came into office saying he would give the war there the attention it required, and the number of American troops on the ground spiraled by mid-2010 to 100,000. Over time, as the public grew weary with the wars, Obama began to steadily withdraw troops. By March 2015, there were fewer than 10,000 there and Obama announced plans to drop the number to 5,500 by the end of 2016. He later agreed to a compromise that set the cap of 8,400 through the end of his presidency. Since taking office President Trump has moved to give his military commanders more control over the day-to-day operations of the wars. Allowing Defense Secretary Jim Mattis to determine troop deployments is one example of that.